Kythera has many beautiful and varied beaches. Some are small and some large, pebble beaches and sandy beaches, easily accessible, difficult to access and some even only accessible from the sea. When choosing your beach the wind plays a big role. From mid-May to mid-September the Meltemi is the dominating wind, a dry north-easterly wind which cools the air on hot summer days. Normally the Meltemi gathers force at the end of morning and drops at the beginning of the evening. If the wind is very strong, it can cause large waves on the (north) east coast, making it less pleasant to swim there. Exceptions on the east coast are the beaches of Palaiopolis (because they are actually facing south) and the beach of Diakofti that is protected from the wind by a pier and an island just off the coast. Diakofti: A paradise for children with shallow and turquoise water and a white sandy beach. Located opposite of the port with some restaurants and bars on the beach. A fantastic place to have in the summer a moonlight diner next to the sea. The beach can be exposed to northeasterly winds. Kapsali: an organized beach (in the Summer) with umbrellas, chairs, water bikes and waterfront cafes and restaurants. 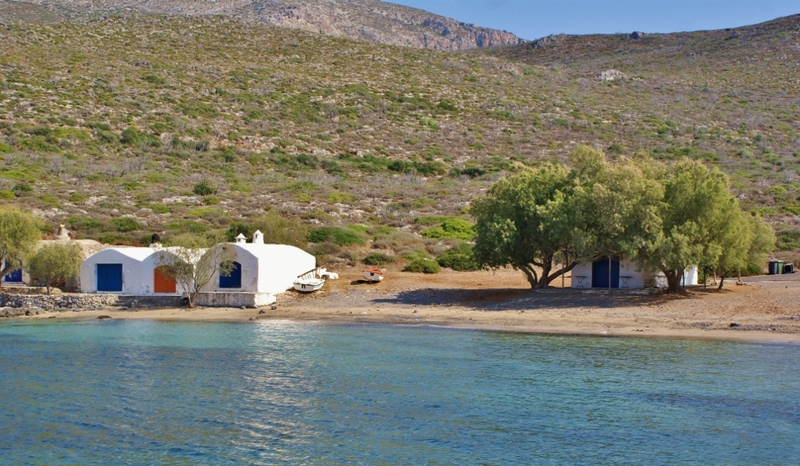 The beach offers great views of the egg-island Chytra and Chora and the Kastro. And while swimming in the bay you might even catch up with a huge sea turtle. 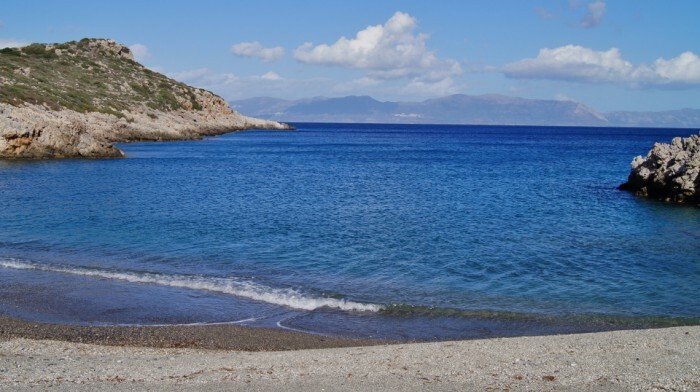 Platia Ammos: situated in the village with the same name, in the north part of the island with a wide, grey sandy beach and beautiful views of the Peloponnese. 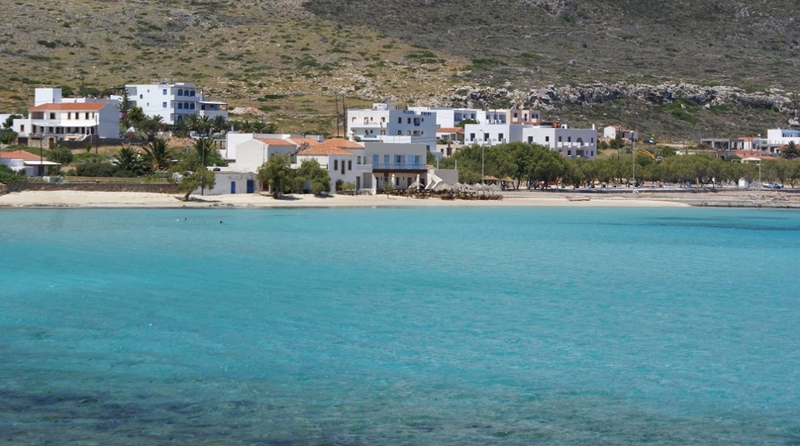 Agia Pelagia: this is one of the largest villages on the island and probably the most touristic one. It has a seafront boulevard with nice restaurants and cafes. There are a number of beaches here, all with panoramic views of the Peloponnese and Cape Malea. 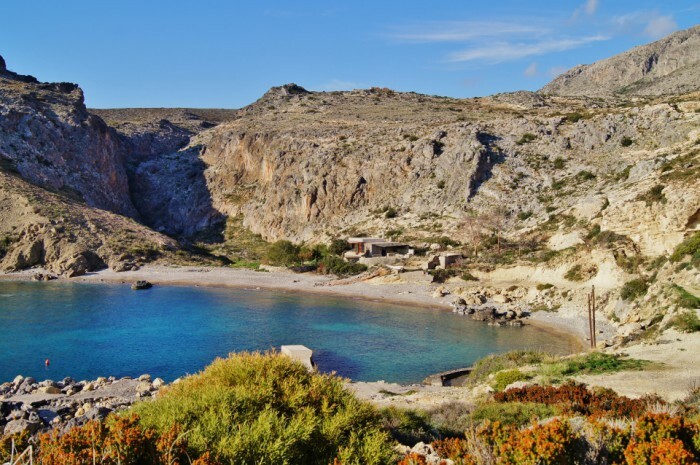 The most beautiful are Fyri Ammos (a red coloured beach), Lorentzo (with crystal clear blue water) and Lagada (a fully organized beach, located near the end of the Paleochora gorge). 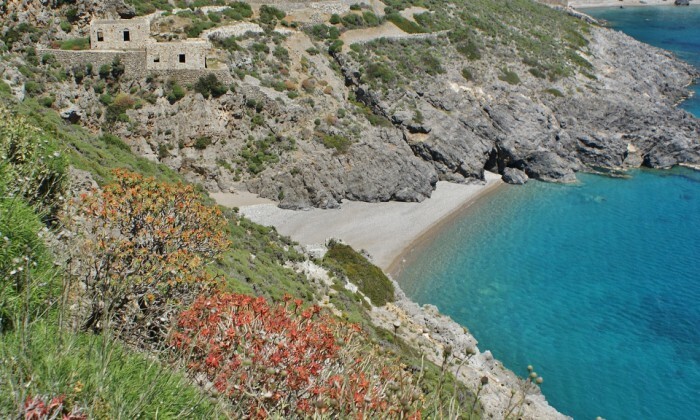 Palaiopolis: the longest beach of Kythera, situated in a beautiful area on the east side of the island. Because the beach is facing south, on clear days you will have a great view of Antykythera and some times you can even see the mountains of Crete. Actually it are 3 beaches which are connected, Piatsa, Vothonas and Limni. Even in the high season you will easily always find a good spot on the beach. 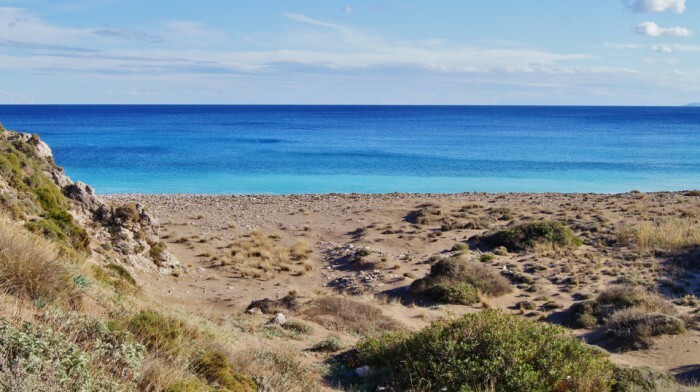 In the area of Palaiopolis and neighbouring Avlemonas are some very nice restaurants and in the summer months you will find a small cantina at the end of the beach. 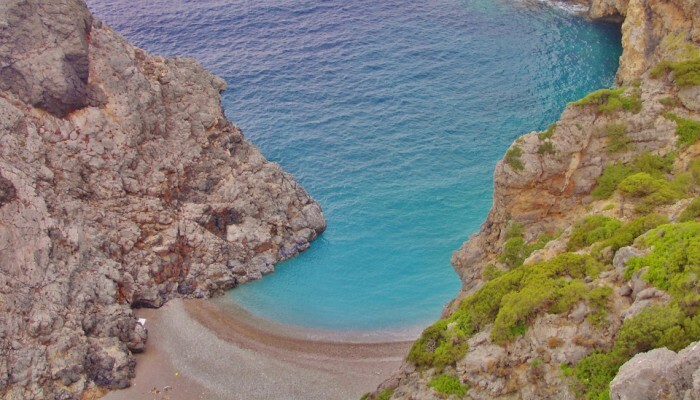 Kaladi: probably the most beautiful beach of Kythera and a great place to go very early in the morning to watch the sunrise. Because of the high cliff in the back of the beach it is protected from western winds. 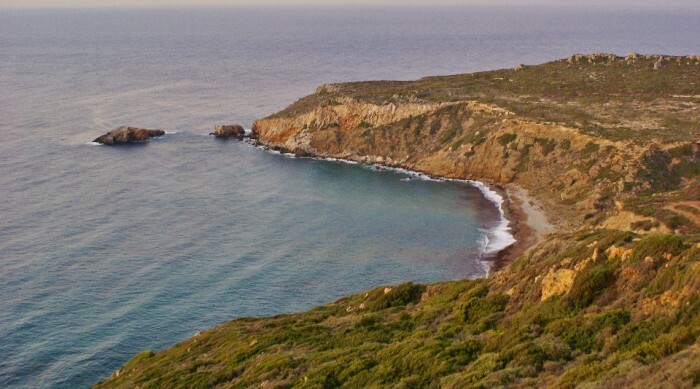 The beach can only be reached by a steep path from the top of the hill with over 80 steps. In the summer months it can be very busy here. 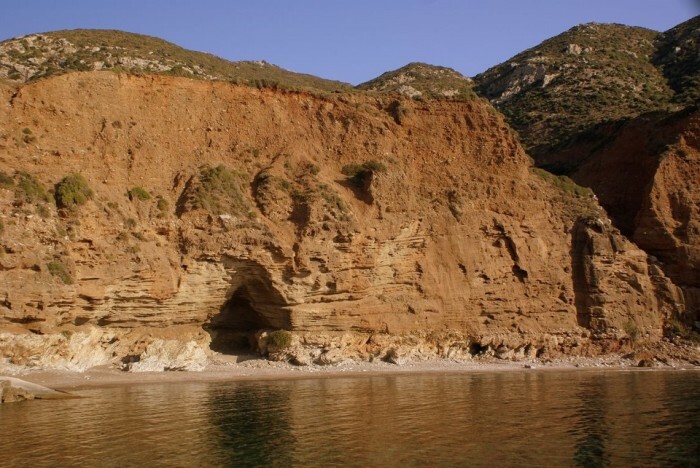 Sparagario: a very beautiful beach, hidden below the Kastro of Chora and opposite of Kapsali bay. It is not easy to reach. Either by a rental water bike or canoe from Kapsali beach or by foot along a steep path from the top of the hill. Half way the hill you will find a church hidden in a small cave. 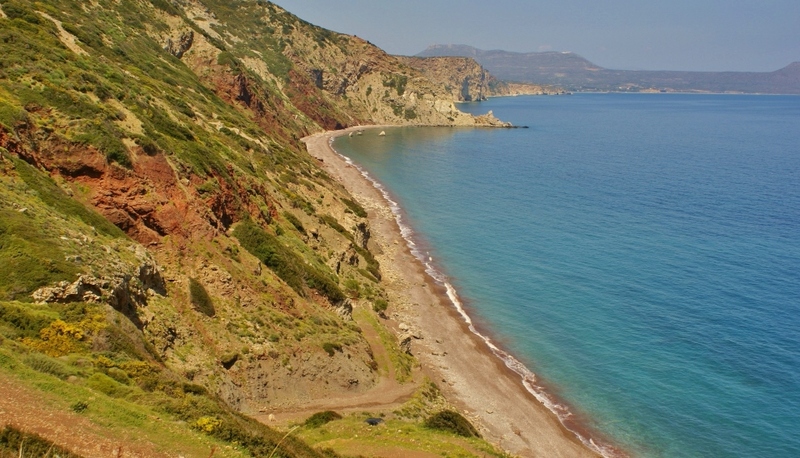 Kalami: to reach Kalami beach you will have to park your car near the monastery of Panagia Orphani. From there you walk for a little bit more than 1 km until you reach the beach. The last part down is difficult but it is worth the effort. A really beautiful beach in between the cliffs with deep blue water. Also a good place for snorkelling. Fyri Ammos (Kalamos): the combination of the scenery, the red coloured beach and the turquoise water makes this a very beautiful beach. Accessible from the direction of Kalamos. The road is difficult but spectacular. In 2013 the beach became a lot smaller as a result of winter storms. Melidoni: the beach lies in the southwest of the island and can be reached by a dirt road from the village of Drimonas. Melidoni has fine sand and deep clear water. In the Summer it has a cantina with music and umbrellas and it can be very busy here. Not really suitable for families with small children. Feloti: although the area around Feloti beach was damaged by a big bush fire not so long ago, the landscape is still very impressive with high cliffs and big rocks spread out on the mountain slope. The road from the direction of Chora is not easy to drive and certainly not suitable for those who have fear of heights. Just before the beach, inside a sea cave, is the beautiful small church of Agia Pelagia. Lykodimou: one of the best beaches on the west side of the island and a great place to watch the sunset. The beach is protected by a high cliff for the (north) eastern winds and on the beach there is a small cave with a fresh water spring. Routsounas: a large, deserted beach on the northeast side of the island. Only accessible by sea or by a very rough dirt road (even for a 4WD car). Limionas: from Mylopotamos you follow a spectacular winding road which reaches after about 7 km the cosy beach of Limnionas. On the beach are some nice traditional fishermen houses, a church and a small cantina. Magic green pool: not a real beach but a spectacular natural pool just 2 meters above sea level. Originally a cave of which the roof has collapsed. The clear green water is deep enough to swim in. 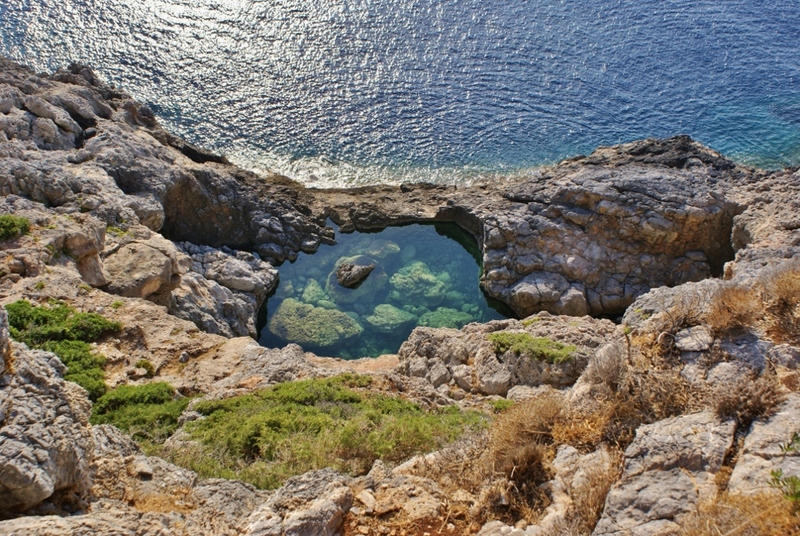 The pool (about 25 m x 15 m) can be reached by a 40 minutes hike from Limnionas beach. From the back of the church of Limnionas you walk along the coast through a garrique landscape in northern direction. The last part you have to follow the blue dots, which are painted on the rocks. It is a difficult part and not suited for those who have fear of heights. Fanakopia: a very small but beautiful beach with small black, white and grey pebbles and turquoise water. 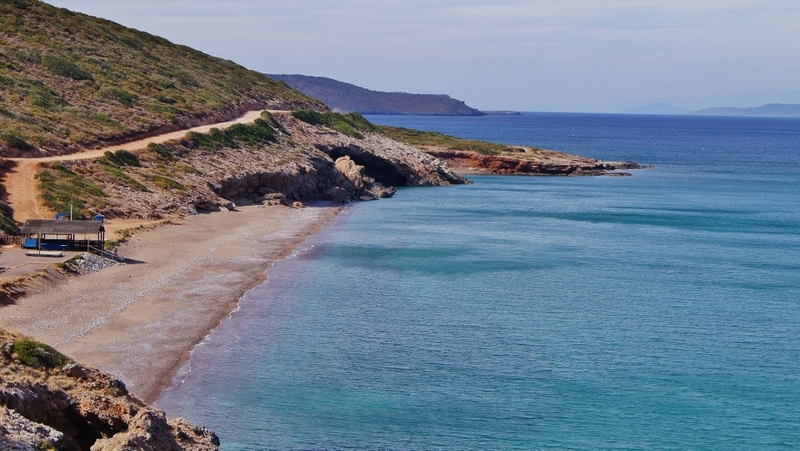 It can only reached by sea or by foot from the road from Mylopotamos to Limnionas. The descent is steep and pretty difficult. 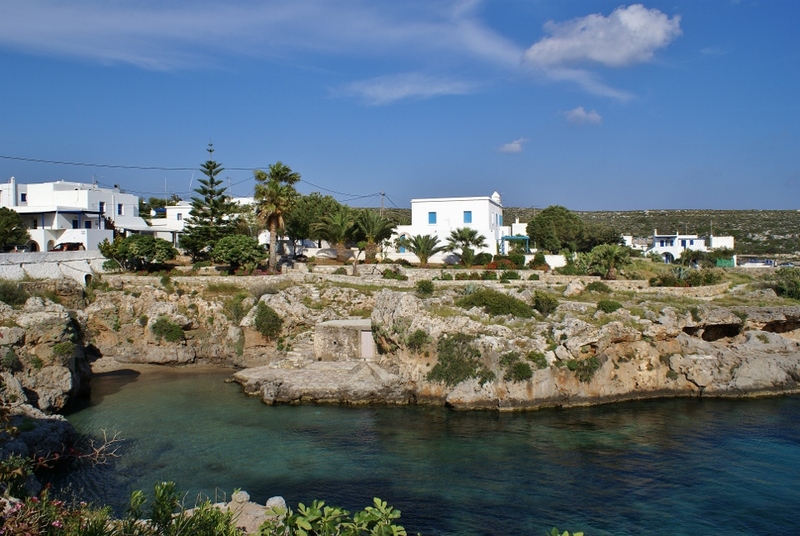 Avlemonas bay: a natural bay with a very small beach inside the picturesque village of Avlemonas. Its located in the center of the village with some tavernes and a bar surrounding it. While enjoying a refreshing drink with some mezedes, you can watch the children diving from the rocks and swimming in the clear green-blue water. Kyriakoulou: a small beautiful beach with crystal clear water and surrounded by high rocks. Accessible by sea or by hiking and climbing (only experienced climbers) for 700 meters through a gorge near the church of Agia Sophia in Kalamos. 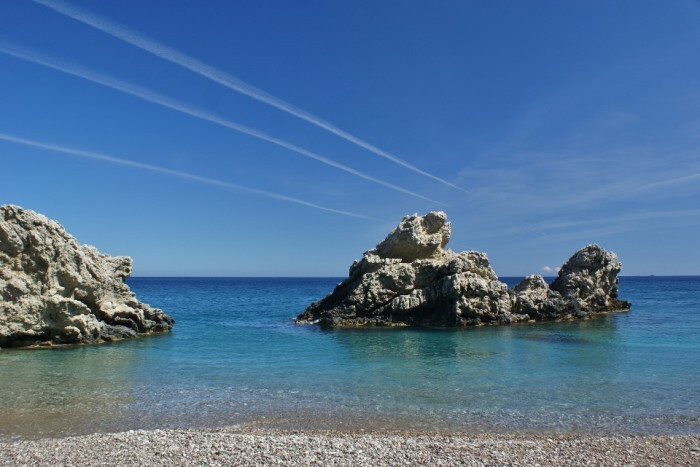 Chalkos: a very popular pebbled beach in the south of the island with a summer cantina and umbrellas. Easy to reach from the direction of Kalamos. 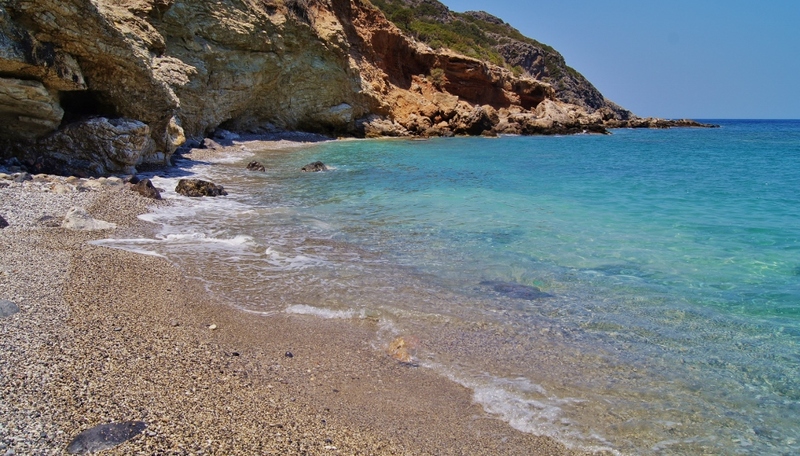 Kombonada: a beach with big white pebbles located on the east side of the island in between Palaiopolis and Fyri Ammos (Kalamos). The surrounding landscape is very beautiful. Accessible through an asphalt road from the direction Livadi/ Karvounades. Fournoi: located on the northeast side of the island and accessible through a dirt road between Karavas and Platia Ammos. In the summer there is a cantina which serves drinks and nice food and sometimes there is live music in the evening. 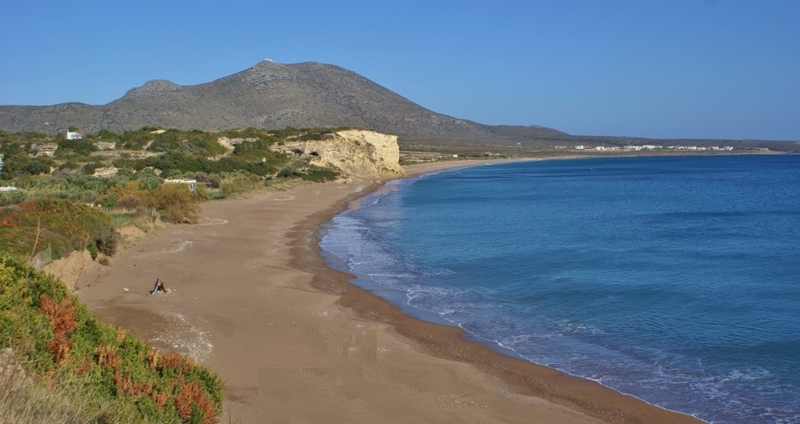 Vlichada: a deserted beach located just south of Kaladi. You can reach it by foot (about half an hour hiking), by boat, or by swimming from Kaladi beach.